Sporting a jet engine from a Phantom fighter plane, this school bus that Paul Stender and his team at Indy Boys Inc. out of Indianapolis hacked together can reach speeds up to 367 miles per hour!! The downside is that top speed is sustainable only for a half-mile. And it takes 150 gallons of fuel to reach it. But that's gotta be a hella scary ride for any kiddies that might be aboard this beast. Stender and his crew used an actual school bus to build their creation but admit having to reinforce it quite a bit because "There's no way the original bus could have withstood the speeds that I take it to." Still, he estimates that about 5 percent, including the door, are original parts. Why a 367-MPH school bus? The self-taught Stender quipped that "I grew up on a farm and to tell you the truth I always wanted to learn things myself and didn't like school much... I guess this is my revenge for all those days riding on the slow journey to school, now it goes at my kind of pace." Mr Stender's creation, which he has dubbed 'The School Time Jet-Powered School Bus', also fires out 80 foot flames from the back creating massive clouds of smoke. Mr Stender, 43, said: "I built the bus for two reasons. The first is to entertain people because, come on, it's a jet bus. "We do a lot of displays at schools and we are trying to show them there's more to life than sitting in front of computers. 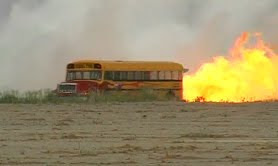 Click on the above link for more, including video of the School Time Jet-Powered School Bus in seriously hot action! He operated this monster at the Winston-Salem air show this year. I have pictures. Absolutely hilarious!